In an article in Voice titled “The digital technology solution to the declining birthrate and aging population,” media artist Dr. Yoichi Ochiai, associate professor and advisor to the president of the University of Tsukuba, wrote that with the birthrate rapidly declining in Japanese society, it was important to first recognize that society was already engaged in a “fighting retreat,” and the standard societal plan of increasing infrastructure to grow the population, and by extension profits and tax revenue, would no longer work. 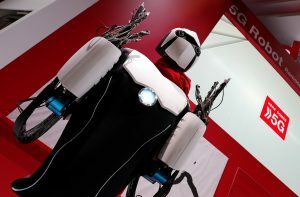 He then argued that the labor shortage could be solved using digital technologies such as robots, artificial intelligence, and 5G (fifth generation mobile telecommunications, which will begin being released in 2020). In particular, regarding methods to care for people with dementia, of which there are expected to be twelve million by 2025, he commented, “In Japan, there is a tendency to have people with dementia avoid internet and smartphone use, but in countries such as the Netherlands they provide inexpensive tablets as part of care,” and argued the importance of using tech in medical care. According to Ochiai, in Japan one caregiver can support up to 15 people at once, but in the Netherlands they can support up to 40 or 50 people. He also noted that in Japan, “Instead of people trying to approach IT, efforts are being made to bring IT closer to people, but that is creating unnecessary development costs,” and argued, “It is important for people to approach tech,” such as by having AI and software deal with problems which people used to deal with. *This page was created independently by Foreign Press Center Japan, and does not reflect the opinion of the Japanese government or any other organization.